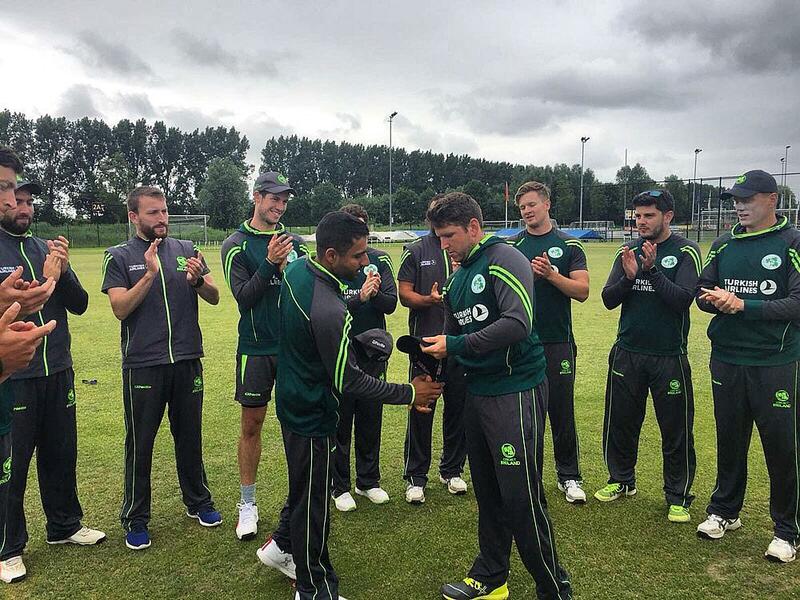 Gary Wilson, the newly named Ireland T20I team captain, called correctly at the toss and had no hesitation about sending Netherlands in to bat first on a green wicket under heavy grey skies. The Dutch side got off to a breezy start, taking 26 runs from the first two overs, with openers Tobias Visee and Max O’Dowd looking intent on causing early damage. Captain Wilson made swift tactical bowling changes and they paid off almost immediately with paceman Barry McCarthy claiming Visee caught by Stuart Thompson at deep square leg (15 runs off 8 balls; 3 x fours). The next batsman, Australian-born Ben Cooper, showed a brief glimpse of his attacking flair but was out caught behind off Thompson for 14 (12 balls; 1 x four, 1 x six). Several more wickets fell to pull the Dutch side back and restrain their scoring rate, but a steadying partnership of 54 runs by Dutch captain Pieter Seelaar (in his first match as captain) and Bas de Leede gave the Netherlands a chance of posting a competitive total. Seelar surpassed his previous T20I best score of 16 runs, scoring 36 (28 balls; 4 x fours) and looked comfortable in the middle, while the 18-year old de Leede played a perfect supporting role for his skipper on debut (33 runs off 35 balls; 3 x fours). de Leede is the son of former Dutch international cricketer Tim de Leede who played for the national side from 1996 to 2007. 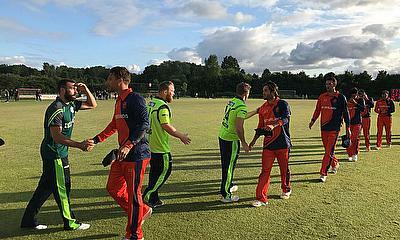 McCarthy, playing in only his third T20 international, looked fired up with the ball in hand. 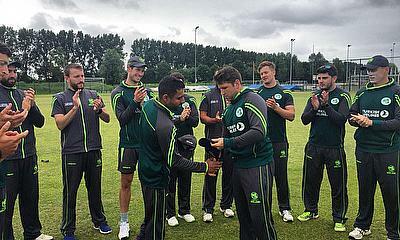 He was playing with the national side for the first time since the ill-fated Cricket World Cup Qualifiers in Zimbabwe in March, and his figures of 3-26 from 4 overs helped ensure the Dutch never got away from Ireland. McCarthy was ably supported by the economical Simi Singh who took three late order wickets – including the important scalp of Seelaar – and finished with 3-23 off 3.5 overs. The Netherlands total of 144 was always going to be tricky on a green pitch that seemed to favour the bowlers – and so it panned out. The Ireland response did not get off to the start they required. After smashing a six and a four from his first few balls, opener Stuart Thompson (15 runs off 11 balls; 1 x four, 1 x six) departed with the score on 18. 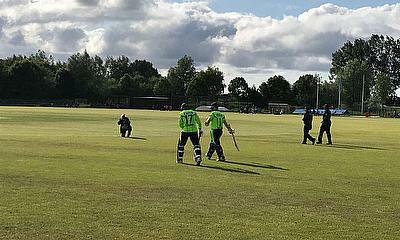 While fellow opener Paul Stirling attempted to steady the ship, the next five batsmen through the middle order all fell for single figure scores as wickets fell with regularity. The Dutch side not only took wickets, but importantly did not concede many runs and were slowly turning the screws on Ireland. 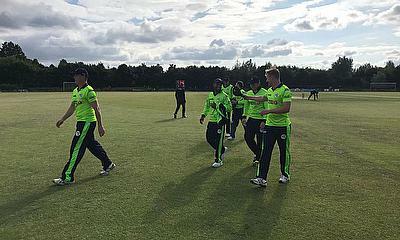 By the time Ireland lost its seventh wicket with the score on just 63, Simi Singh and George Dockrell found themselves together with the task of scoring 82 runs from 41 balls. There were a few in the crowd, and back at home in Ireland, that must have held out some hope, given that Singh and Dockrell had recently put on a world-record seventh-wicket partnership for List A matches of 215* in a recent Inter-Provincial Cup match for Leinster Lightning, and they indeed started to show sparks of that form. The pair put on 36 runs in just over three overs, with Singh taking the aggressor role. 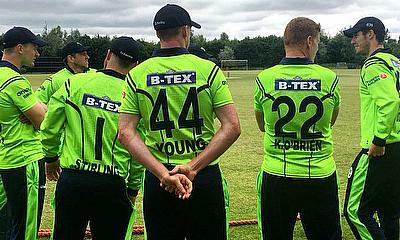 When Dockrell fell for 9 (from 10 balls), Singh and the new batsmen Barry McCarthy were staring at 49 to win from 22 balls. The task certainly daunted neither of them and the pair proceeded to score 44 runs from those 22 balls – falling agonisingly short of the target. Singh in fact faced the last ball knowing that a six would win the game, but Paul van Meekeren coolly bowled a ball up in the blockhole and prevented a miracle finish by Ireland. Singh ended on 57* (29 balls; 4 x fours, 3 x sixes) and McCarthy on 11* (6 balls; 1 x six). 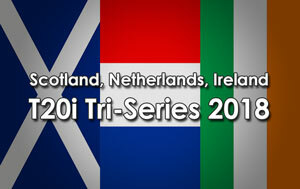 The second T20I between the two sides will be at the same venue tomorrow. Cricket fans should note that a livestreaming service will be available for the game. Details are available here.